This snake is missing the pigment, melanine, which gives animals much of their coloration. 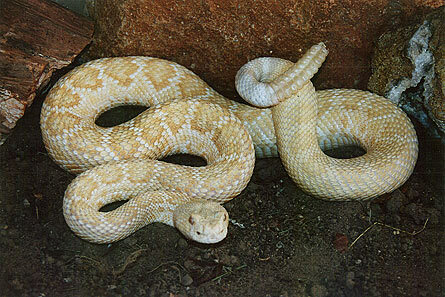 This condition is somewhat of a rarity in rattlesnakes. Albinos born in the wild are at a great disadvantage as they are easily spotted by their natural enemies and are usually killed early in life. This specimen was captive born at a reptile breeding facility and will live a long life in the protection of the Museum. She may eventually reach a length of over 6 feet and be seen by over one million people in her 20 to 30 years of life. Take time to observe this beautiful snake. You may never see another like her. Visit the Rattlesnake Museum in Old Town, Albuquerque!